How much does it cost to travel to Vanautu? How much money will you need in Vanautu? VUV43,677 ($390) is the average daily price for traveling in Vanautu. The average price of food for one day is VUV2,096 ($19). The average price of a hotel for a couple is VUV78,788 ($703). Additional pricing is in the table below. These average travel prices have been collected from other travelers to help you plan your own travel budget. Previously known as the New Hebrides Islands, Vanuatu is an archipelago nation consisting of 83 islands in the southwest Pacific Ocean. It is located just east of Australia and north of New Zealand, covering a large north-south spread of islands. This makes for a range of tropical climates from hot and humid in the north to mild and dry in the south. Some of the more popular activities include experiencing local culture, hiking and visiting natural wonders of the islands, beach-going, and water sports. Torba consists of the northern Torres and Banks Island groups. Sanma includes the largest island of Espiritu Santo and the smaller island, Malo. 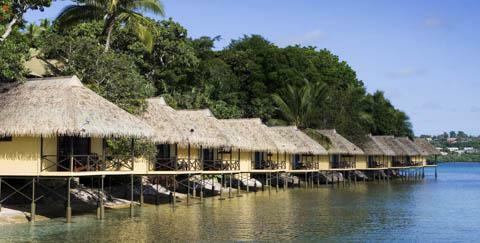 Santo is also home to the nation's largest town called Luganville. It is a place bustling with markets, friendly locals, restaurants, cafes, and bars. The biggest draw to the Island is the wreck of the SS President Coolidge, a WWII troop carrier sunk by mines in 1942. Penama includes the central-eastern islands of Pentecost, Ambae, and Maewo, which are all fairly large and rural with jungle villages, volcanic mountainsides, and a more traditional way of life practiced by the natives. Malampa includes the central islands of Malakula, Ambrym, and Paama, as well as the Ambrym Volcanoes and its active lava lakes. Some trek out to the volcanoes and camp on the ash plain to get the full experience, though it is important to be fully stocked on food and water. The province of Shefa includes the islands Epi, Efate, and 14 others with the Shepherd Islands. The nation's capital, Port-Vila, is located on Efate and has become a point of entry and hub for most tourist activity. Outside of the capital, Efate is made up of coconut plantations, local villages, jungle, coves, beaches, and tropical reefs. Tafea is the southernmost province and includes the islands of Erromango, Tanna, Anatom, Futuna, and Aneityum. Mount Yasur Volcano is a popular attraction located on the island Tanna. As far as activities goes, a visit to the Vanuatu Islands can be anything from a leisurely tropical beach escape to an action-packed adventure of volcanoes, bungee jumping, and scuba diving. The abundance of wrecks, underwater volcanoes, and diverse marine life make Shefa's outlying islands a popular destination for snorkeling and scuba diving, while Malampa and the island of Tanna are attractive locations for the volcano enthusiasts. Mount Yasur Volcano: Located on the island Tanna of the Tafea province, this volcano is often called the most accessible active volcano on earth. It is said that the glow of the volcano was what attracted Captain James Cook to the island in 1774. Guided hikes can be taken up to the rim with great photo opportunities. Land diving in Pentecost: Pentecost Island is known for being the spiritual birthplace of bungee jumping. The extreme sport originates from an old ritual called nanggol, or land diving. The ceremony is ongoing between April and June where men jump from tall towers with vines tied to their feet. Tourists can participate for a fee at certain locations on Saturdays during the season. SS Coolidge Dive in Santo: The island Espirto Santo is home to the wreck of the SS President Coolidge, one of the top 10 wreck dives in the world. This is one of the top attractions on Santo. Mele Waterfall and Cascades: One of the most-visited natural sites in Efate, the cascades is a series of picturesque falls surrounded by gardens. Lap-lap: a root vegetable cake usually made from manioc (kasava), sweet potato, taro, or yam shaved into the middle of a banana leaf with island cabbage and sometimes a chicken wing on top. This is then wrapped up and cooked in hot stones underground until it melts into a cake. Tuluk: similar to lap-lap, the cake is rolled into a cylinder with meat in the middle, tasting a lot like a sausage roll. This and lap-lap are common in most village markets. Steak: Vanuatu is known for its meat because it is all naturally grown. Kava: a local drink made from the roots of a type of pepper. It is intoxicating with sedative effects, should be enjoyed slowly, and should not be mixed with alcohol. Traditionally served in a shell, usually coconut, though some bars serve it in a bowl.